The Modern Reverse Mortgage isn’t new… “newish”, but not new. 1987 was when The Department of Housing and Urban Development launched their version of a relatively new concept, a mortgage that deferred any payment until the borrower no longer lived in home, named “The Home Equity Conversion Mortgage Demonstration”. 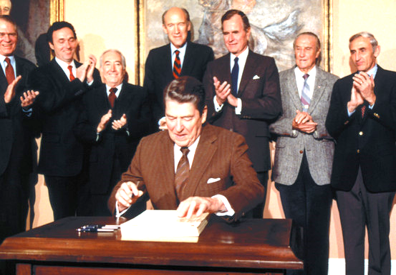 It was then signed in to law by President Ronald Reagan in 1988 and became the safest, smartest and most sensible mortgage in America, still not fully recognized by consumers and professionals alike to be the outstanding financial tool that it is designed to be. With that Americans were given a government created, government regulated and government insured version of the Reverse Mortgage to replace the original private Reverse Mortgage that so many had come to loath. And while the very first Reverse Mortgage, executed in Portland Maine and designed to help a recent widow remain in her home, was a true act of kindness by then Dearing Savings and Loan… well, banks left to their own devises soon shifted the tables on the borrower from their favor to, surprise… the banks! All we ask as you spend time on the pages of this website is to keep an open mind. Realize that much of what we take for granted as common knowledge is nothing more than the opinion of others. Check our facts, do your diligence. The link below is the nexus of all that you need, the very entity that created the Modern Reverse Mortgage.